Parkers has already witnessed the successful update of Ford’s best-selling Focus model, but this is the first time it’s been seen in public. The good news is it looks just as good under the harsh motorshow lights as it did before. There’s a striking new face that brings it neatly into line with the current Fiesta and forthcoming Mondeo, plus the rear lights now house LEDs and the tailgate has been smoothed off. Changes continue inside, where the cabin has received an upgrade in materials as well as new instrumentation and an eight-inch colour touchscreen. Ford tell us the new Focus will also feature a pair of new 1.5-litre diesel and petrol engines, with power outputs ranging from 94- to 178bhp. To complement the new engines there’s stiffer front suspension for better accuracy and control along with a new electric power steering system. 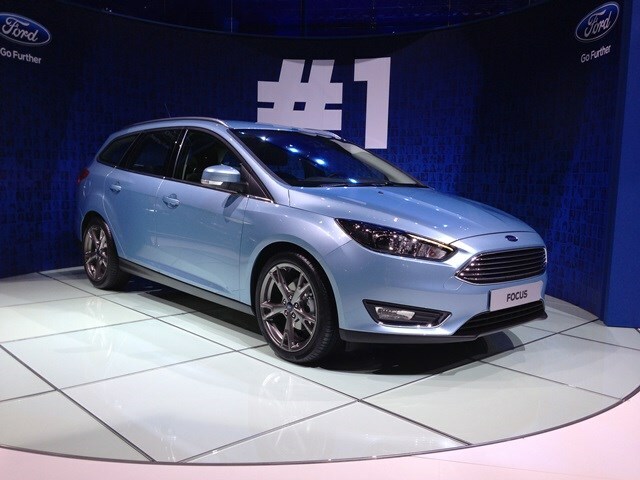 If you want to find out more about Ford’s family hatchback and estate, have a look here. The Edge nameplate can already be seen in America, but Ford's global strategy means that we'll soon see this Mondeo-based crossover here in the UK. It's only a concept - for now - and it's already been seen at the 2013 LA motorshow, but this is its first European debut. Larger than the Kuga (it's based on the Mondeo) the Edge concept mixes sharp looks with plenty of technology and luxury.